Dragon paladin is coming again ! Well, that's one way to push Dragon Paladin when there are almost no Dragons in standard. Very strong common. Possibly insane in arena. They probably cost 4, don't they? I think the card is alright versus other slow decks - it enables dragon synergies - though the deathrattle effect seems slow to me. As I said in another thread, it appears that the Dalaran's protectors are getting cards, which combine 2 resources in themselves (not just in form of twinspells). So it's nice to see more examples following this pattern. Great value for a 3-mana minion. I'm curious about the mana cost of those 4/4 dragons, though. Seems pretty decent. 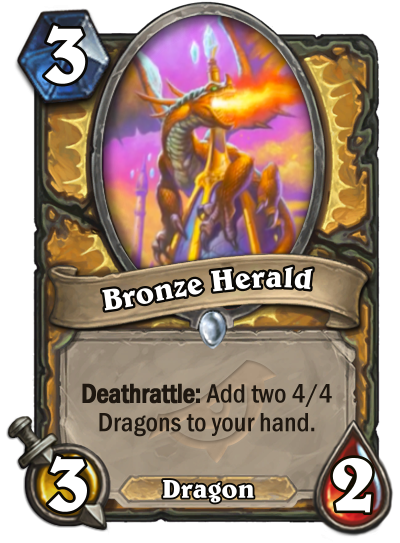 I mean I can't imagine it'll see play unless Dragon Paladin is a thing but seems like a good supporting card in that context. Also seems like it should be strong in Arena, you're taking a slight hit on the stats but assuming the dragons are 4/4 for 4 then that's some pretty punchy resource-generation in a mode where that's really powerful. Particularly in a class like Paladin. turn 3 play this, turn 4 a true silver or something, turn 5 the hand buff guy, turn 6 4 mana7/7's + a filler 2 cost card or hero power or maybe a 6/5 fairy dragon, turn 7 another 4 mana 7/7 with a 6/5 bronze dragon. to do all the process again. They are finally trying to make dragon paladin a thing. In blackrock mountain we got a paladin dragon called Dragon Consort and even though it had a strong effect, paladin did not get any dragon support. Hopefully this time the devs gives dragon paladin the proper support for it to be a competitive deck. This adds 4/4 dragons for 4 mana. Play Dragon Speaker to give them +3/+3. We get 4 mana 7 7 dragons. So basically a card must be broken to see play otherwise it is unplayable ? Doesn't really synergize with the little gargoyle bro that came out with Witchwood. Cathedral Gargoyle can now be a powerful turn 2 play for paladins if they get enough dragon support. Dude if paladin gets more dragon support cards in this expansion then dragon paladin may actually become a thing. Can't wait to see what the other paladin cards have got to offer. Yeah, 4 mana 7/7, on turn 6 at best after you played low tempo cards on turn 3 and 5. Basically glorified Boulderfist with dragon tag. Don't start to imagine this is as good as Flamewreathed Faceless. They can’t be played on t4 though.